My dear friend Jamie from Love Bakes Good Cakes offered to help with a guest post while we are moving this month. Please give Jamie a warm Kathe With An E welcome! Thank you so much for having me over again, Kathe! I know you are busy lady and I'm so glad I can be here with all of your wonderful readers again! I guess I should tell you a little bit about me? 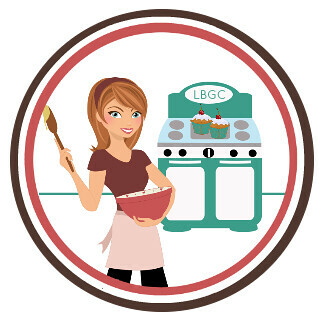 I'm Jamie and I blog over at Love Bakes Good Cakes. Don't let the name fool ya though, I share family-friendly recipes that are easy on the cook and on the budget! I'm also a homeschooling mom with 5 kids. You could say that "chaos" is the normal at our house! :) We recently moved to Phoenix from North Carolina, so I totally feel for Kathe and Mr. B right now. I know how un-fun moving is! Enough about me, let's talk food! The last time I was here (almost a year ago), I shared my One Pot Goulash recipe. 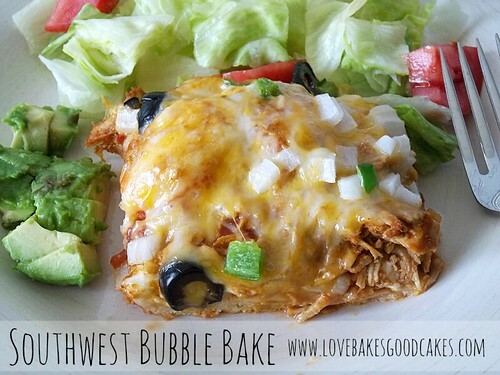 I let Kathe pick the recipe today and she went with my Southwest Bubble Bake. Maybe some of y'all have heard of "bubble bakes" before ... but for those of you who haven't, it's basically biscuits topped with almost anything you can imagine and baked. It reminds me sort of being like a deep-dish pizza. My family really likes Mexican and Southwest inspired food, so I tried to come up with something to appease us! :) If you're a fan of Mexican/Southwest cuisine, this will be right up your alley! This is a super simple recipe - and if you have leftover taco meat, you could easily skip that part of the recipe to make this a super easy meal! You can also skip all of the spices by using a packet of taco seasoning - the choice is yours! I hope y'all enjoy! If you'd like to see more great recipes from Love Bakes Good Cakes, I have about 250 (and counting) recipes in my index. I'd love for you to come over and have a look around .... you can find my social media links below too if you'd like to catch me there! Spray a 9x13-in. baking dish with cooking spray. Quarter the biscuits and place them evenly in the prepared pan. Top with salsa. Set aside. If using chicken: In a skillet over medium-high heat, add the chicken breasts and cover with water. Bring to a boil. Reduce heat to medium-low and continue to cook (replace some of the water if necessary) until the chicken is easy to shred with a fork - about 10-15 minutes. Drain the water and shred the chicken. Add ⅔ cup water and the chili powder, flour, cumin, salt, pepper, paprika, garlic powder, onion powder, oregano and cayenne pepper. Cook and still until most of the water has evaporated. If using ground beef: In a skillet over medium-high heat, cook and crumble the ground beef until meat is no longer pink; drain. Add ⅔ cup water and the chili powder, flour, cumin, salt, pepper, paprika, garlic powder, onion powder, oregano and cayenne pepper. Cook and still until most of the water has evaporated. For both versions: Add the cooked and seasoned meat to the prepared pan. Bake uncovered for 20 minutes. Top with cheese, onion, green pepper and black olives and continue to bake for an additional 10 minutes or until the biscuits are cooked through and the cheese is melted. Serve with avocado, additional salsa and/or sour cream, if desired. *** Note: You may substitute one package of taco seasoning for the chili powder, flour, cumin, salt, pepper, paprika, garlic powder, onion powder, oregano and cayenne pepper. Yummy recipe! I will try it soon.Thank you for sharing. I have never heard of the term bubble bake before and have been cooking with biscuits for quite awhile. Is it a southern term? Moving, yikes, hope it's not too stressful! This dish sounds so good, pinning, thanks!